There's a new release out! It's a scifi time travel romance called The Sojourner! it's on sale at Amazon for $2.99! All her life Sara McGregor has felt adrift, searching for. . . something. Part of her past is shrouded in mystery, thanks to her enigmatic mother, long dead, and she's struggling to figure out what course her life should take. Dropping out of college and a string of failed relationships has trapped her into a holding pattern. There's got to be something more than her dead-end job, her current loser boyfriend and the pointless rat race of life. Something is missing. 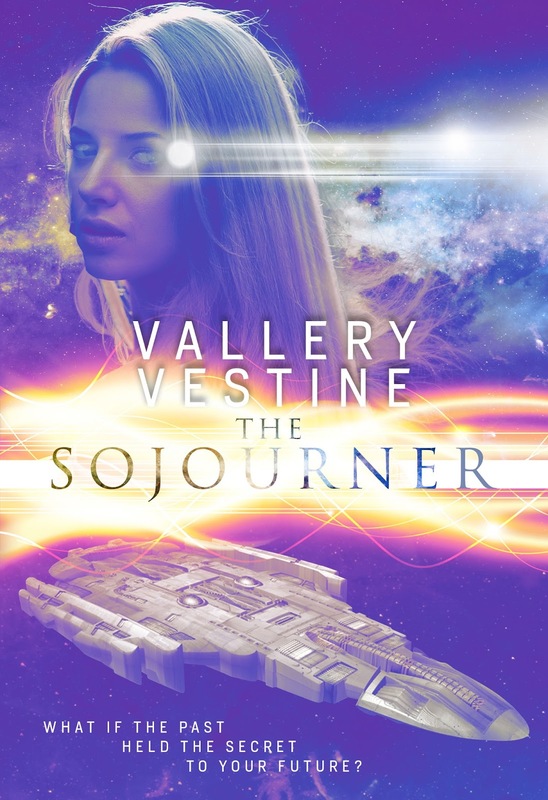 A strange astronomical event coupled with the power of a family heirloom blasts her into the future, far away from her world and from everyone she's ever known and loved. She accidentally lands on the ship of a handsome pirate captain. Viewed as an unwelcome stowaway at the least, a dangerous spy sent to harm the crew at the worst, the captain is convinced that she's been sent to assassinate someone very close to him. Sara's in over her head and must think fast to convince the captain she's innocent. Sara's game for the excitement but does she have what it takes to survive among a den of space pirates who don't trust her? Survival among them depends on the captain accepting her account of how she landed on his ship and discovering her identity. The answer lies in the mystery surrounding her secretive mother, an answer that may save her life and help her chart a new destiny. Andrew got up and went through his usual routine before he left to open the bookshop. It was just after five o'clock in the morning. He fixed a pot of coffee and sat down to drink and read the paper. The distinct patter of steady rain was soothing and was a refreshing relief from the heatwave. He got up and peeked through the kitchen window curtains, put there by his wife, long dead. They reminded him of her. They still carried the scent of rendered beef tallow. Andrew was surprised. Though he welcomed the coolness of the rain it was the dead of summer. It hardly ever rained at he end of July. He wondered at it just the same. Something about this sudden change felt strange. He was no adept but he learned to pay attention to the life behind things; to the things that others didn't notice. "Hmm." He put down the paper and went to the fake mailbox in his backyard. Perhaps one of them had left a message before they left. Perhaps Trillion did. He couldn't take the risk of becoming lazy and not checking the box. He put on some slippers and a raincoat and made his way to the backyard to the mailbox hidden deep in the bushes, that he and Trillion used to pass on secret information to each other or others. Andrew, please give this letter to Dan. It's urgent that he receive it for I don't know when I'll be back. I've discovered recently that I'm being followed - this doesn't surprise me, nor should it surprise you - and I have no wish to put you or the others in danger! It may be a very long time again before I contact you. Or maybe not at all. I really don't know what will happen now. The thing must take its course. And be mindful, your duty and position as Keeper of the Doorway is already upon you. Things are going to become very dark, very soon, Dan. I fear that I will not always be there for you. Please use the techniques I taught you to train the other two on the team and protect Andrew. He's risked his life to help us meet safely. You are all travelers now and your abilities will be heightened. It will be a dangerous time for all of you. When you pass through, open, or close the doorways things change and matter rearranges itself and so will your body and mind. Pieces of you can be left on the other side and this can dangerous if those pieces of you are essential to your humanity. Be vigilant, stay awake. Not everyone who seems liekea friend is a friend. This last battle is going to be waged differently from the others the redshifters have fought against you. Andrew sat down slowly and then read it again. He felt his hands shake. It reminded him of the discussions he'd had with T in the past. The heat had been turned all the way up, the stakes were high. His bookshop long ago was once a place where a wormhole had opened up, but it was a different sort of portal than those in the rest of the main network. Before this bookstore was built, other stores, such as several grocery marts, a small law office and a medical office had existed in the past in this spot, and each business had seen odd, unexplained things happen. So much so that until he'd arrived and opened the bookshop the spot had a reputation for being haunted. Andrew remembered those early days. The little bookshop had attracted a cult following in Portland for the strange activities that would happen while people were browsing. Books and other objects would suddenly levitate. It had helped keep him afloat for many years. He remembered when Trillion had started coming. A tall, mysterious character in dark gray who would hang out in the store all day, at times. Trillion the time-traveler. He had shown Andrew one night over some beers why these unexplained things happened and after that they'd struck up a friendship and an alliance as Andrew was slowly introduced to the threat looming over humanity and Earth. As for the old wormhole, Trillion had managed to fully close it and keep it hidden. His world had been turned upside down after that meeting years ago. Well, there's nothing for me to respond to by letter right now. He thought. Andrew felt nervousness rise in him. He had anticipated a day like this would come and T had prepared him for it well enough. The problem was, he was no brave hero. Would he be able to hold down the fort while the others were away and protect them when they came back? Could he truly be the Keeper and Watcher of the Doorway under his shop? The time had finally come to open the wormhole under the shop. Andrew fought valiantly to still his fear and shaking hands as these thoughts stained his mind. He sat on the couch gazing at the rain. The streets were slick, the sky dark, signaling an omen. He folded the letter and envelope and took the note and stuck it on an end table. He had a safe box here in the house and he had a safe box at the shop. He would hide the letter until Dan and the others came back. And he prayed that they would come back. Andrew finally rose from the couch and continued to get ready to open up the shop. And ten hours later, when he was alone and the shop closed, the portal. Trillion managed to temporarily drop his shadower on the way to the shop yesterday but the shadow was back as he made his way towards the east side pier. He knew this day would come, when they would find him. He could easily evade humans. This one was like him. In fact, he sensed others working in tandem with his shadower. The invasion task force had been hunting rebels like him for years right after WWII, slowly sniffing them out and putting them each to the question. The last twenty years they had grown complacent, thinking they had handed the rebels a devastating blow. So many of his friends and compatriots before the 1970's had disappeared. He shivered to think of what may have happened to them. He shivered, thinking of her. He knew their deaths had been cruel. Their leaders brooked no dissention nor disagreement in any way on the Expansion. Now his time had come. He only hoped the letter would reach Dan and that Dan would be strong enough to be a stabilizing force for the little group. He also hoped that Andrew would be able to find his courage to help them. He hoped that he had given them enough. Other groups he had founded and trained only to see them fail and disappear, cut down by the redshifters. But there were other blueshifters taking up the fight. In fact, the strength of the blueshifters the world over was growing, which was why the hanyar were stepping up their own attacks. But their complacency over the years would come at a price. This gave him hope. Trillion felt the cool breeze of the Willamette River running off the waves as he hurried down the walk way on the pier. He would miss such precious little gifts this world had to offer. He could feel them surrounding him even thought he couldn't yet see them. He turned down a corridor walkway that led under the bridge when they caught him, ambushed him. "It's about time we found you, traitor," said a voice behind. Trillion stood still and remained silent. The time had come. He was prepared. "Not going to speak? You will, eventually. We'll find out all your little secrets. and what you've been doing all this time out here. Oh, she'll get you to talk before you die." Trillion felt a wave of sharp tension run through him and this sensation, too, he treasured for soon he would be robbed of all thought and emotion except pain and then death, but he remained silent as stone. He could see their shadows, blacker than black, pour of the fainter shadows under the bridge all around him as the cars rolled by above them. He could feel the invisible chain field closing around him, a giant fist. of energy that rendered him immobile and then crushed around him. Well, they've at least improved on technology. He thought with grim amusement. The first time they'd caught him years ago the energy chain wasn't strong enough to hold him and he'd broken free. He could try to run for it again but that would be foolish. "Do it!" One of them said harshly to another and a wormhole was opened. The energy from it was frightening, the screaming winds sounded like sonic cleavers in his ears. Trillion shuttered to hear it. He felt the dreadful power from it, slowly sucking his cells inside. The hanyar were masters at taming and controlling wormholes, imperfect as their technology was. He still marveled at it. If only his people could have used it for good instead of for the Expansion, Seeding and Settling. He feared the High Sentinel, but in time, she would come to fear him also. He smiled inwardly as he was transported through place and time, through light, pain and darkness.He was ready for them on the other side and they didn't even know it. Whether he would survive this was another matter. No rebel caught ever had as far as he knew. But the work would carry one on Earth. He laughed as he wound through the wormhole, his physical body tearing apart; blood, bone and flesh being stripped off from his hanyar form and disappearing into the singularity as he traveled back to his accursed home so far away. blueshift fiction is a way-station to places strange and wonderful, unknown and infinite. Sojourners come, take your ease while you look with starry eyes toward the marvelous way that awaits.